The season of nuts is upon us, and squirrels are once again being admired for being so industrious. Don't they gather up and bury all those acorns and other nuts? Aren't they responsible for planting forests full of oaks, hickories and beeches? Not necessarily. Biologist M.R. Chettleburgh has found that during the single month of October, 30 to 40 jays can gather and plant more than 20,000 acorns alone. The jays are caching them for future use, but often forget their whereabouts, allowing the nuts to sprout. On average, jays carry these acorns a quarter mile from the tree that bore them, but often they fly them a half to three-quarters of a mile away. No lazy, old squirrel is going to haul an acorn a half-mile. Clearly, jays are the real planters and spreaders of our woodlands. In Siberia, in fact, they are protected by the state because of their forest-expanding abilities. 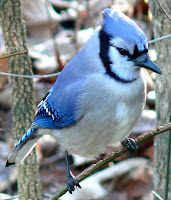 And maybe that's why Blue Jays are so noisy at this time of year, screeching and squawking seemingly from dawn to dusk: They're whining about all the credit the squirrels get for being hard-working. Interesting! I didn't realize they halled them that far.-Jays are fascinating to watch anyway. Yes, Larry, jays are very interesting -- and smart. They are Corvids, same family as crows and ravens. Some say they deliberately imitate the sound of a hawk to scare off other birds from sources of food -- such as feeders. I live in SoCal and am a great admirer of the acorn woodpecker who also are great gatherers, but of acorns. It's not unusual to see a telephone pole or an older tree full of holes and each hole has an acorn in it.